The first production of Spoon Millionaires will be held August 10-12 and 17-19 as part of Playfair 2006, the annual event held at the Lima Civic Center in Lima, Ohio. It will be directed by George Frazee. Full production details can be found at www.spoonmillionaires.com. The play was born as a novel, Congruent Love Triangles, way back during the Reagan Administration. John Kriens and I wrote three chapters of a book during our study halls, and that's further than we should've gotten. In college, when I was faced with an upcoming comedy troupe show (more on the troupe at another date) and only half my actors available to me, I decided to abandon the sketch format, write a full length play and bring in a new cast. 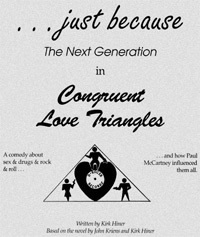 I took a few jokes and a few plot elements from Congruent Love Triangles, and wrote a fairly decent play. That was 1991. Fifteen years later, I did a minor rewrite, sent it off to Jim Jividen for ideas, did three or four major rewrites, changed the title thirteen or fourteen times, then sent it off to Playfair. Here we are. Set at the end of the 80s (1986, to be exact), Spoon Millionaires is inspired by the prime time soaps of the time: Dallas, Falcon Crest, Knots Landing...B.J. and the Bear. However, reduce the mean character age by ten, have the guys remove their shirts and the girls kiss each other, and it's suddenly based on The O.C., One Tree Hill, Smallville...B.J. and the Bear. The story centers around the impending fall of the Witherspoon Family and their record company, Spoon Records. Facing financial ruin, the Archduke Witherspoon hatches a desperate scheme involving a stolen tape and a Paul McCartney look-alike. Wackiness ensues, right? Well, if your definition of wackiness is murder, infidelity, drug deals gone bad, Chex Mix and Satan himself, then yeah, wackiness ensues.